Virtual Laboratories are learning and research environments allowing users to design, setup and perform experiments in a computer. 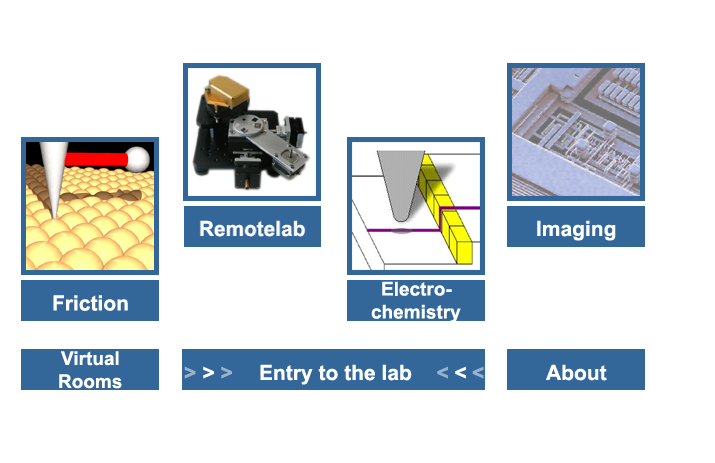 The project Virtual Nanoscience Laboratory plans the realization of a virtual nanoscience laboratory consisiting of three virtual experiments to give an insight into the methods of nanophysics and nanotechnology to undergraduate students of different disciplines. The virtual experiments are presented within the scope of a co-operative learning environment. 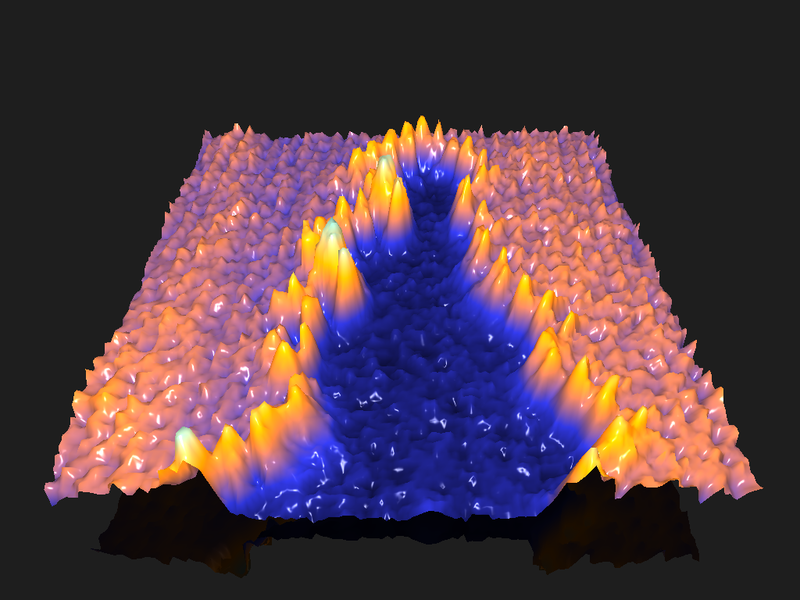 In recent years nanometer-scale science and technology has gained a lot of interest among researchers and the public. Boosted by the development of scanning probe methods by Nobel laureates Gerd Binnig and Heinrich Rohrer at the IBM Zurich Research Laboratory in Rüschlikon, it has become an active field of research and technology. The fascination of investigating, and manipulating, matter in very small dimensions has attracted a large number of research groups, and pictures showing how matter is built up from atoms and molecules regularly make it to the broadcast and printed news. The prospect of nanotechnology is extremely bright, since it promises higher integration, increased functionality, lower-cost and better environmental compatibility of future processes and devices. 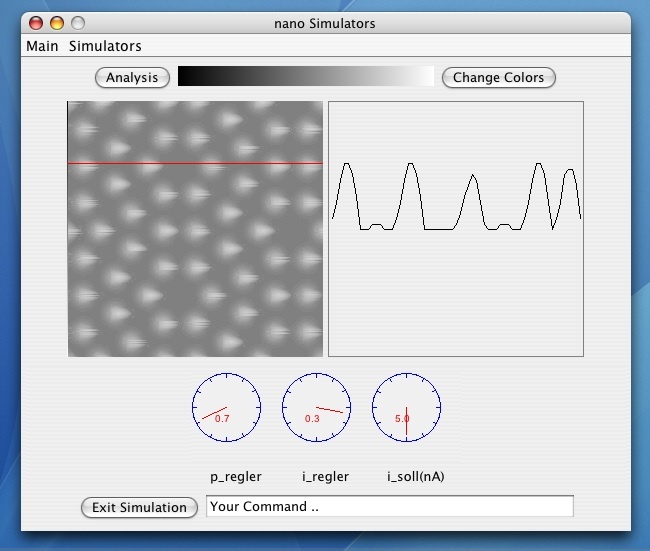 Numerous applications are already visible. Science on the nanometer scale naturally touches on conventional disciplines such as physics, biology, and chemistry. Therefore, training in this new field is not only highly important for the relevance of the field for the merging technologies, but it is also very demanding for its high level of interdisciplinarity. Future nanotechnologists will have received training in solid-state physics, molecular chemistry, analytical chemistry, and engineering. The University of Basel, such as many other institutions of higher education in Switzerland, does not yet account for these new needs. The present proposal intends to make a contribution in this respect by offering virtual university-level experiments of nanoscale science and technology. 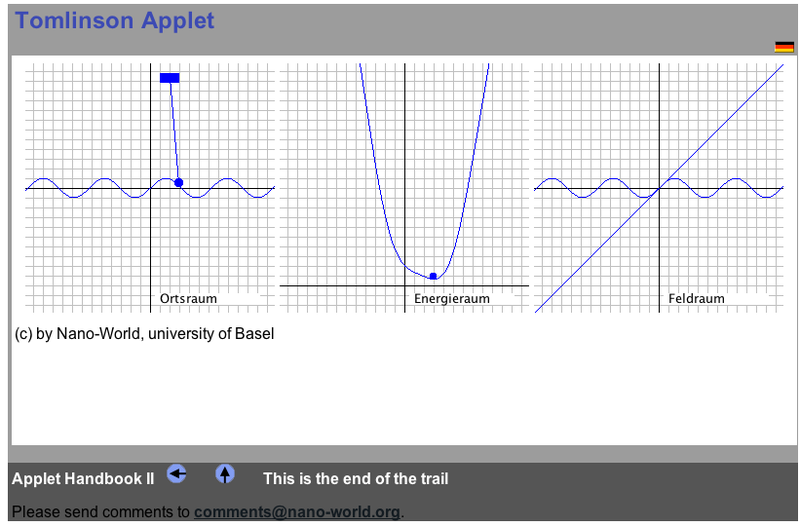 A demonstration of a virtual nanoscience laboratory: The specific subject contents of the learning basis are elaborated in close co-operation with the newly established National Center of Competence and Research in nanoscale sciences in Basle. The development of virtual basis establishes a new era of didactics and methods. Europe is setting out onto the eLearning age; Swiss Virtual Campus is a pioneering program and makes an important contribution to the education in the 21st century. Take this everyday phenomenon: to slide a box across the floor, energy has to be expended to overcome the opposing frictional force between their surfaces. Intuitively we assume that this frictional force results from the interaction between rough surfaces. So we would expect friction to be absent from smooth surfaces on the atomic scale. However, friction does exist even for such smooth surfaces; this is explained by the Tomlinson mechanism. In 1929, the British scientist G. Tomlinson put forward an explanation for atomic-scale friction: as the box in our example is pushed across the floor, there is a mutual “plucking” action between the atoms on both surfaces. But the atoms spring back to the resting state if the maximum tension is exceeded, and then oscillate around their initial position. At the same time, their kinetic energy is dissipated as heat. The demonstration translates Tomlinson’s explanation into a visual model with clear, easy-to-follow sequences: a ball attached to a spring is dragged across a hill and valley structure. The ball and spring together represent the atoms at the surface of the box, the spring represents chemical bonding, and the hill and valley structure is the floor. The model demonstrates that the movement of the ball cannot be continuous: at a certain point the ball jumps to another position and vibrates. In the same way, the actual atom jumps back to its initial position and vibrates; this vibration manifests itself at the atomic level as heat. As shown in the position chart (Fig. 1, left) the position of the ball support may be varied by moving the bar to which the spring is attached. The energy level chart (Fig. 2, middle) shows the total energy of the system for different spring constants; this is not an interactive model. In the field chart (Fig. 3, right) the spring constant can be changed by rotating the blue line. 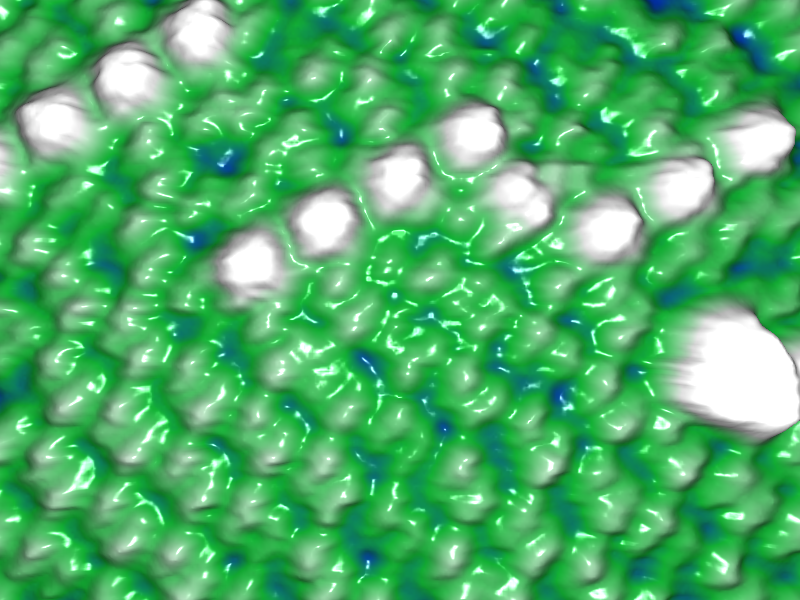 The tool Image3D supports the 3D visualization of a three-dimensional relief data from nanoscale science experiments. The computation is web based, interactive and required neither expert knowledge nor special software. Users can upload their data.